Megs Blogs: Fun Fall Snack Mix! Fall is here! Today is finally the first day of fall, and although it doesn't feel like it here in Texas (95 degrees today) I am pumped. Fall is probably my favorite season, and with the Christmas season creeping earlier and earlier each year (No, I don't want peppermint coffee in October!) I decided to get a jump on things, even if it's still sweltering outside. When you walk in my house, I want you to feel fall. I have all the fall decorations out, the fall scented candles are burning, and the "pumpkin pie" wax is in all the scentsys. I pulled out my glass pumpkin jar I got last year, and I needed something to fill it. 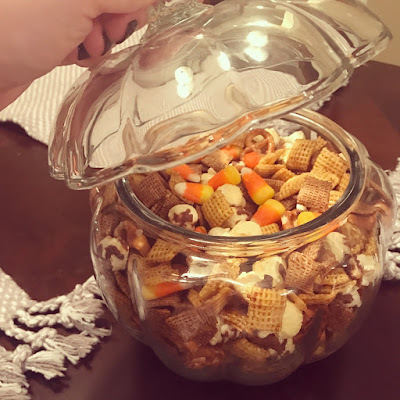 Candy corn seemed a bit too boring, so I went to Pinterest. 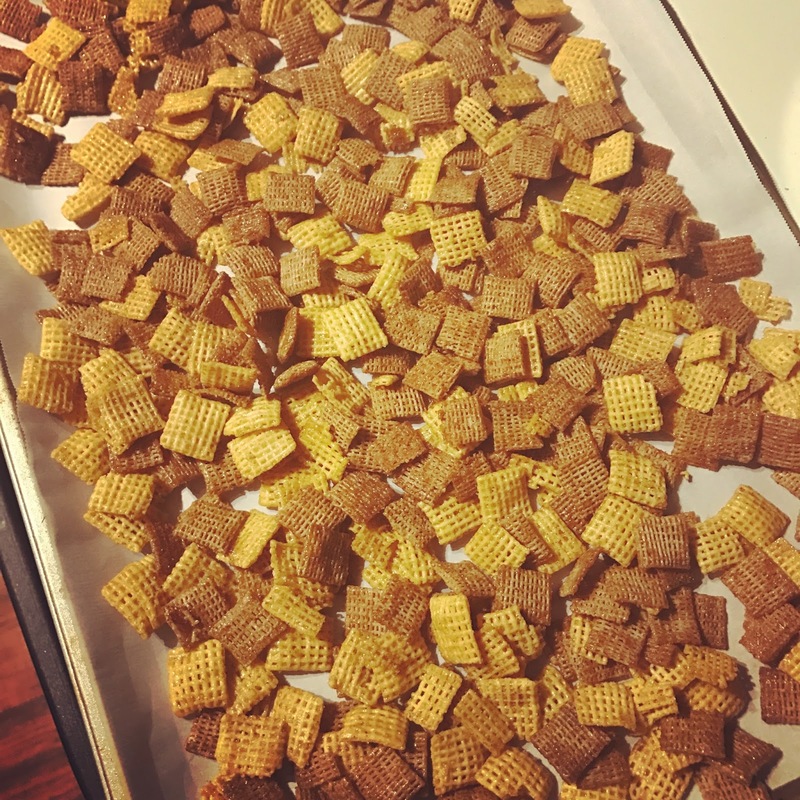 I pinned a few snack mixes, but none were really what I wanted, so I made my own recipe. This recipe is so easy because you don't really need to measure. I am just not a measuring kinda girl. I really rarely follow a recipe. Usually I glance at a picture on Pinterest and just try to make it on my own. A lot of times I don't even bother reading the ingredients lists. Oops! There are a few similar recipes on my on my Pinterest here if you're someone who prefers something a little less thrown together. That is where I got some of my inspiration for this particular mix. 1.Melt butter in a dish, add vanilla and set aside. 2.Mix together your brown sugar and pumpkin spice. You can use more, I just wanted a really thin coating. 3.Toss your cereal in butter mixture, and then in the sugar/spice mixture. 4.Microwave this mixture for about three minutes, stirring every thirty seconds. 5.Lay on a baking sheet to cool. 6. While the cereal mixture is cooling, pour your remaining ingredients into a bowl. I used my festive glass pumpkin! 7.Finally, pour in cereal mixture and lightly toss, so everything is well mixed. 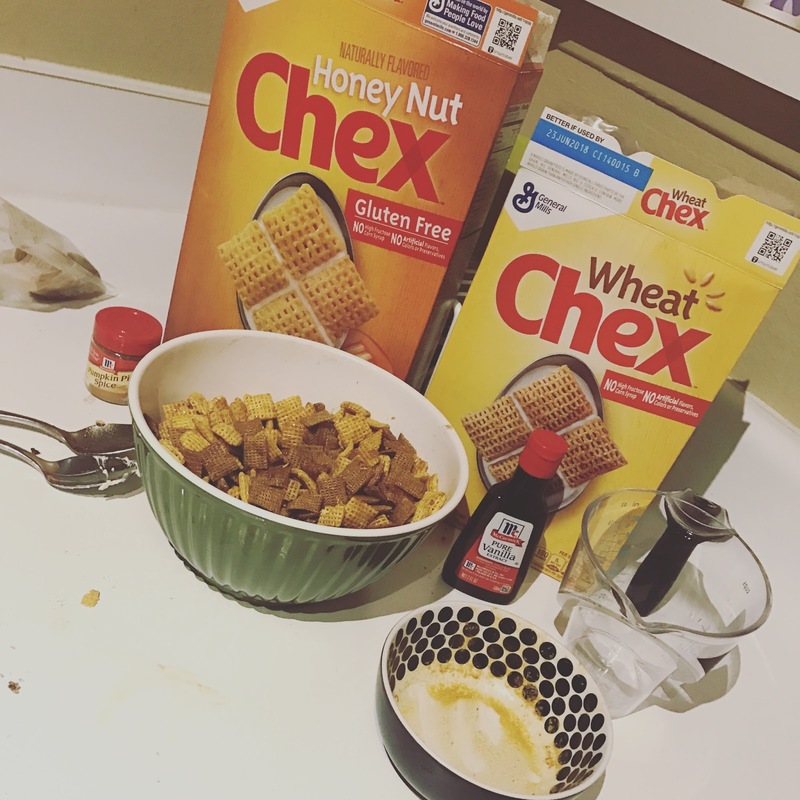 *Make sure the cereal is really cool so that your other ingredients don't melt when they come together. It's as easy as that! The perfect thing to fill my pumpkin jar. I like to keep mine on the coffee table or our dining room table for guests to munch on when they come over.